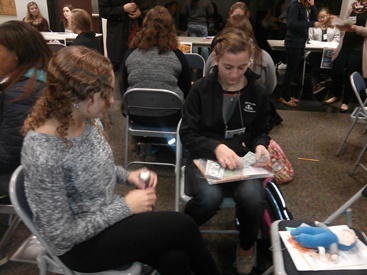 More than 60 students from various Daemen academic courses participated in the college’s poverty simulation event that took place on Nov. 18. Using four real-life scenarios, students played the roles of individuals living in poverty, such as a single parent or a hungry child. Each of the 15-minute segments equaled a week of poverty experiences, including the loss of a job, eviction and feeding a family, while struggling to pay bills, find employment, pay for groceries, and other daily challenges. The poverty simulation was presented by the United Way of Buffalo and Erie County; Dr. Sharon Benz, community coordinator of the Daemen Center for Sustainable Communities and Civic Engagement; Dr. Sharlene Buszka, associate professor of business administration; and Dr. Mary Fox, associate professor of early childhood education.